Byron Patterson, a senior analyst at a leading Washington DC-based aerospace and defense strategy consulting firm, was the inaugural winner of the Bell Helicopter Vertical Flight Scholarship. His longtime passion for aircraft led him to study aerospace and mechanical engineering at West Virginia University; however, it was his first job after college at Boeing in Ridley Park, Pennsylvania, that cemented his involvement with the vertical lift industry. Within the Boeing Vertical Lift flight controls group, Byron primarily supported the Adaptive Vehicle Management Systems (AVMS) program, and aided in the design of the external load stabilization control system to stabilize a slung load in order to reduce the pilot’s workload. The culminating design and flight test analysis, and the control laws developed from this research, were later presented at the AHS Forum in 2014 and 2015. Byron returned for his graduate studies at the Massachusetts Institute of Technology, where he worked on devising helicopter vibration reduction methods under the advisement of Professor Steven Hall. Specifically, he applied the linear parameter varying control synthesis technique towards optimizing the stability performance of the controller throughout the flight envelope, which achieved improved vibration rejection compared to previous higher harmonic controllers. Byron first joined the AHS Philadelphia Chapter through the recommendation of Mr. Steve Glusman, then the director of advanced vertical lift for Boeing Phantom Works in Ridley Park. Byron maintained his connection with AHS after moving to Boston for his graduate studies, and seized opportunities for professional development and academic support offered by the Society. His outstanding research in helicopter rotor control and prior professional accomplishments earned him the top scholarship from the Vertical Flight Foundation in 2015. “The VFF scholarship is something that I was, and am continually, grateful for, as the scholarship allowed me to focus on my studies and thesis work. Outside of this scholarship, I would have had to take on more teaching assistantship positions, which would have limited my time to focus on the topics that I found most interesting,” Byron recounted. Through continued involvement with the AHS Federal City Chapter, which serves the Washington, DC metropolitan area, Byron is able to stay up to date on developments in vertical flight technology, especially in the emergence of the unmanned aircraft industry. This is critical to serving his professional clientele, which spans from major helicopter manufacturers to companies with vertical flight aspirations. It is with this network and his technical understanding of vertical flight technologies that Byron is able to serve clients in determining the trends and business implications of these technological developments. 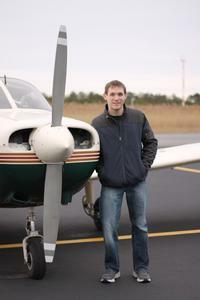 Byron continues to fuel his passion for the aerospace industry as a private pilot, and enjoys flights above the Shenandoah Valley or along the Chesapeake Bay.